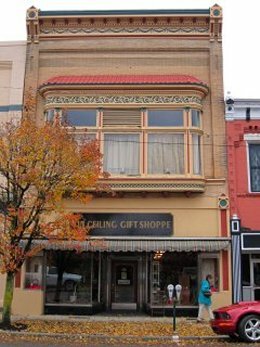 The Tin Ceiling Gift Shoppe on 51 Main Street in Bradford, Pennsylvania is a quaint gift shop that offers something for everyone from Country and Primitive to Victorian themed gifts. 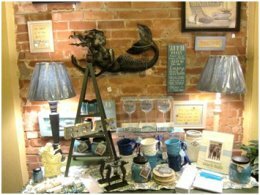 See why more people shop at the Tin Ceiling Gift Shoppe when they want a special gift. Enjoy a sample such as dips, cheese spread, coffee or tea while strolling through the store. Find the home decor area stocked with Amish furniture, window treatments, lamps & shades. The kitchen area has wine themed merchandise, jams, dips, Harney & Sons tea, coffee, scone mixes, kitchen linens, recipe books, boxes and cards, cookbooks, mugs and teapots. Sports Lovers will find golf, motorcycles, hunting, fishing, horses, cats and dogs in the outdoors area. There is a jewelry counter, a beauty section, gifts for baby, knitting supplies, throws, table runners, doilies, and candles from nine different companies. The Tin Ceiling Gift Shoppe also sells local art by Tom Seagren and Silhouettes by Michelle Huber Chapman.